Disaster Movie 2012 is a jaw dropper! When I was at the PGA conference in LA a few weeks ago, I met with the visual effects team who were responsible for Roland Emmerich’s new global disaster epic ‘2012’. At the conference they gave a very entertaining and informative seminar on the visual effects for the film, and how they did some of them, which culminated in a sneak peek at the new movie. Indeed, Emmerich’s quote of ‘Too much is not enough…’ really did ring true. I just found out that the trailer for 2012 is now on Apple’s trailer site and watched it yesterday. Blimey! If it can be destroyed, it seems they WILL destroy it! I mean this is destruction on a Biblical epic scale. Looks like a very entertaining slice of nonsense and I am looking forward very much to seeing it. If you have not seen the trailer yet, check it out here. On another note, I spent all of yesterday with producer Judy Goldberg, sat at the back of the studios, planning and scheming the next project(s). Nothing to announce JUST yet, but the wheels are now in motion. Watch this space. "Well impressed, Chris Jones gets the top banana award for inspiration, education and provocation. His course "The Guerilla Film Makers Advanced Masterclass" illuminates a road that few have ever successfully traveled. He maps out the terrain with the skills of a battle hardened SAS pathfinder and is your survival guide in the feature film production jungle. Hunt him down and get equipped before you start your campaign and you might just make it. Chris directs his audience through the minefield of independent film making with confidence and clarity. His own experience as a 3 time feature film maker and writer of "The Guerilla Film Makers Handbook" allows him to deliver his hard won insights with more conviction and pragmatism than just about any other independent filmmaker in Britain today. His perspective and depth of knowledge is unique and an invaluable resource for anyone wanting to follow in his footsteps on the path to full feature film production." "the opportunity to talk to people who have "been there" and "done that" was of inestimable value. A very worthwhile weekend"
Drop us an email to confirm your place and then send a cheque payable to Hard Copy, to Hard Copy, Ealing Studios, Ealing Green, London, W5 5EP. GET YOU MOVIE MADE NOW! The Guerilla Film Makers Masterclass will be run by the author of The Guerilla Film Makers Handbook and Movie Blueprint, Chris Jones, and will be held at Ealing Film Studios over the weekend of July 4th / 5th. Watch a video of how the event played out here on our blog. For some time now I have had a stack of DVD’s piling up on my desk, disks with clips on them that I need to rip and edit, usually from stuff from other festivals where I did some PR or the like. It’s just a big archiving job really. But getting the data of the DVD, edited and then back onto a DVD without re-encoding, therefore losing quality, has always been a problem. I have done it before in Avid abut there was all manner of frustrating ‘field inversion’ issues and it took forever to convert into editable Avid media. Yikes. Doing some research I just came across a very small and lightweight editor called Womble MPEG Video Wizard DVD. It’s main claim that interested me was that it could edit MPG (DVD) files natively, that is without converting to another format first (which takes ages and reduces quality). There are several of these kinds of programs on the web and I have tried most, usually finding them so ‘consumer centric’ as to make them almost useless for me (they are used for people who have hard drive video recorders and want to save to DVD, stuff that they have recorded, but also edit out the commercials). It turns out that Womble is a terrific little editor. Sure it’s never going to replace Avid, FCP or even Premiere, but its fast, it’s intuitive and so far has worked flawlessly with NO re-encoding at all. There is a trail version on their site which you can check out here – it costs about £30. There’s lots I would change about this programme, but I can’t complain as it does work flawlessly and is super cheap. Check it out. Sales Delivery Schedule Workshop a HUGE success! Wow. What a day. Last week I worked relentlessly to prepare the Delivering Your Film To The Sales Agent workshop. It was based on a ‘sales schedule’ I had been handed on a real ‘low budget’ feature film I had been consulting on only six weeks ago, so it was very fresh in my mind. The workshop was essentially a deconstruction of this list, and it took all week to get it into place, and even had me working through Saturday night to be ready for the twenty odd strong group on Sunday morning. But I am glad I did because the reaction was nothing short of extraordinary. Stand out moments included David Wilkinson, distributor from Guerilla Films, coming to talk to the group about the realities of UK distribution. I remember looking round at the group who were all listening so intently to his experience and wisdom and noting how engaged they were – this was echoed later by one delegate who said it was one of the most important conversations she had ever listened to. It literally transformed her view of distribution. During the workshop, it became very clear that the major cost for any indie film is carrying the cost of making 35mm prints. We all know so many films are being shot digitally now, but what people forget is that 35mm is still the dominant distribution format. Sure, we may have some digital theatres here in the UK and we can capitalise on that, but around the world, 35mm still rules. Who, for instance, is going to swap out thousands of old 35mm projectors in Indian cinemas and replace them with high tech super expensive digital projectors? Some of those 35mm projectors will be over 50 years old and still going strong. They will be going sting in fifty years too. What is the compelling reason for those exhibitors to swap out the old for new? We must remember that our films are made for a global marketplace, and today, I can go into any cinema in the world with a 35mm print and be reasonably sure I can project it. Not so with any digital formats. And so, the larger sales agents ALL still require your film on 35mm with all the bells and whistles. And you want to be working with those reputable guys and NOT the fly by night operators so many low budget film makers get stuck with. Of course this all assumes you WILL get a 35mm release for your film – certainly most of us want that, but is it realistic? TV, DVD and internet distribution are far more viable, and in that case, we could drop the very costly 35mm elements. This was perhaps one of the pivotal conversations of the day. Answered all the questions I didn’t know existed! Will give you the confidence to deal with sales agents and distributors. Chris has demystified the dreaded contract making it accessible and clear, giving real explanations to abstract and confusing legal terminology. I am sure I can approach sales agents and distributors with far greater confidence… Great stuff! A tiring amount of information presented in a succinct clear way. Really helpful and necessary for every new film maker… Inspirational! I am delighted at the feedback as I was concerned during the day about our delegates as let’s face it, deconstructing a sales contract may be needed, but it’s hardly a barrel of laughs! But it seems we managed to keep things on the entertaining side at the same time as getting the message over. In fact I am so pleased, I think I am going to expand this into a 2 day course, the first day covering the deal making aspect of film sales – how do you do a deal with a sales agent on day one (working through the contract) and on the second day, this course on working on delivering your film to the agent. I am doing the final prep for tomorrows Delivering Your Film Seminar and I am delighted that we will have a packed house. I was afraid that as this is a stage at the end of production, most people would say ‘we will deal with that when we get to it…’ But it seems there is a lot of interest in this vital step between film maker and audience. People are really thinking forward in order to fix problems before theye even occur. I have been wearing out my printer as I wanted to actually hand every delegate a physical example of every document (just a few in the pic! ), legal statement and contract as an example – even the eleven page Errors and Omissions Policy, five page Dolby contract and loads of statements to be signed by various cast, crew and producers (even though it was not advertised, I am also giving delegates a CD of the relevant blank forms so they can just fill them out when they get to production). Expert in this area, Sara Janazs, has been helping out with the real nitty gritty detail, and on the phone yesterday, she told me how, even on bigger films, the film makers are amazed at how much stuff is required by the sales agents. And having just closed a TV sale for ‘Gone Fishing’, I can tell you that you even need to supply some of this stuff for a short film too. I am really looking forward to his new workshop now. It’s going to be a long day of mega detail though. I hope the delegates bring several notebooks! If you want to come, there are still a few places left – you can sign up here. On another note, casting director Catherine Arton is in Canada at the Toronto World Wide Shorts Film Festival, where she arrived sick as a dog! She got doctored up (Canadian style which is apparently superb) and is now on the fix (opening night review here). We should be getting some reports from her in due course, as well as Associate Producer Alan Coulson who attended the Tokyo Short Shorts Film Festival on our behalf. Still waiting to hear with bated breath. And a rare treat arrived in the post today, possibly our most unusual trophy yet from a festival win! It’s a wooden plate, engraved, and sent from the Big Island Film Festival where Gone Fishing won the Golden Honu, for Best Short! Awesome! I have been working all day on the Delivering Your Baby* (*that’s your film) seminar which I am running on Sunday at Ealing Studios. In conversation with various distributors and sales agents, I am struck at how hard it still is to make delivery of a film, especially in this day and age. It’s arguably even worse as HD means ten different things to ten different people, never mind navigating S4PFS, 23.97PFS 4:4:4 colour sampling and audio stem mixes! I have just gone through an HD nightmare myself with one major festival who first said they wanted ‘HD’, I enquired what kind of ‘HD’, then they said ‘HDV’. I said that sounded odd, and they cam back with, ‘sorry yes, HDCam’. Two days later I got the mail, sorry we meant ‘HDCamSR’! And this is just a festival! Reading through the full delivery list sends a shiver down my spine. It really does. I know what I am doing but crikey, this stuff is soooo complicated and there is so much of it. Anyway, that’s one of the reasons why I set up the workshop. So if you want to know what a Copyright Search Report is, how much it costs, and what it looks like… and you may need one in order to sell your film (along with over 50 other esoteric bits and bobs in a standard delivery schedule for a sales agent, including umpty thrumpty versions of your film), then book your seat now. This FILM workshop could save you tens of thousands! We know that your movie is your baby... But like all babies, when the time is right, it needs delivering - for films, that's the point where you hand your movie over to a sales company, and it's usually the point where things, for indie film makers, start to fall apart... That's why we built this workshop. MAKING THE GREAT FILM is one thing, we know you can do that…! But after the premiere, and after you have cut your deal with the sales agent, you will be presented with a 12 page ‘delivery schedule’, a mind numbingly detailed list of potentially hundreds of expensive items that they say will be needed to sell your film. It’s not just the movie, there is sooooo much more. This seminar will uncover EXACTLY what you REALLY need to deliver a film to the market, when you need to deliver it, and how much it will cost. WHAT SALES AGENTS ARE SAYING - After interviewing many sales agents around the world, their number one problem when dealing with indie producers is that the film makers often underestimate just how much time and money it takes to fully deliver a film, saying ‘do we really need all this stuff?’ and ‘but we have no money left’. Delivering a professional feature film to a sales agent can, if left unchecked, cost upward of £50k! YES WE KNOW, that may well be MORE THAN YOUR BUDGET! YOU COULD GET RIPPED OFF IF... One thing that often happens is the sales agent says, ‘I will cover the cost of delivery’. In reality this means they will go to a big company and get it all done for you, and pay top dollar too. That’s YOUR money they are spending! They don’t mind, they get there commission off the top of any sales first, and anything left over goes to paying back the cost of delivery. The upshot? You rarely get any money. It's up to you to be professional. Worse still, we have come across situations where some sales agents also OWN the delivery companies, so they PAY THEMSELVES YOUR MONEY to do work you could hussle for much less, or even for free. Knowledge is power! DATE JUNE 21st (Sunday), Venue Ealing Film Studios - £99 inc VAT. CLICK HERE and use the BUY NOW button. If you are going to sell your film on DVD, online or even a small cable channel, what will you need? This is mainly technical stuff, but some legal paperwork will be needed too. So you have made an ultra low budget film and you have someone interested in selling it. Most likely one of two things will happen. One, your film is a hidden gem and they will do a deal with Lionsgate or Miramax etc, and you are away as they will rework your film anyway. Or they will sell it piece meal, territory by territory… So what are they REALLY going to need to close these smaller deals with say a small German distributor? Or a Korean buyer? This delivery list will be the bare bones minimum needed to exploit your film commercially. Remember they want an easy life so they will demand EVERYTHING IMAGINABLE. It’s up to you to understand what it all means and negotiate the delivery schedule down to something manageable. So you had some money, not a lot, and you have turned in a terrific pic and the sales agents are talking about Cannes, Toronto, German Theatrical… These guys will hit you with a terrifying list of technical and legal requirements. We go through this list in detail, remove what is not needed and finally settle on the definitive deliver list for films in the 21st century. 10:00 Film Sales recap. Doing the deal and how it all works. During the seminar, we will hand out samples of paperwork and provide physical elements to handle so you fully understand what these items are. We will also show relevant video clips and run through, in detail, QC (Quality Control) report sheets. Attendees will also receive contacts for companies and institutions you may need to work with in order to make full delivery of your film. YOU HAVE COME SO FAR, DON’T FALL AT THE FINAL HURDLE! The workshop will be led by veteran film maker and author of The Guerilla Film Makers Handbook, Chris Jones and will also feature expert guest speakers (TBC). If you want to know more about sales, read the free interview pulled from The Guerilla Film Makers Hollywood Handbook here. The course is held at Ealing Studios in West London. If you would like to know more or book a place, call the office on 020 8758 8544, mob 07977 516 628 or send us an email with your name and phone number. If you want feedback from our other courses, you can read it here. 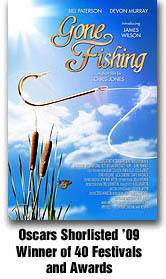 'If I ever win an award for film making I will thank Chris Jones in my acceptance speech. Honestly! "Combines showing you the daunting scale of what you are undertaking with inspiring belief that you can do it." "I feel I've now got the confidence and knowledge to make the jump from shorts to features. It's so rare to have an opportunity to listen to someone who doesn't treat me like an idiot. I've learnt so much - every minute was golden to me." "I learned more about film-making in two days than I did in two years of academic study. If you only attend one course this year make it this." I am back in the UK and enjoying the fact that the weather here is about as good as it was in LA! The next feature for Moviescope landed on my desk today, an article I wrote about piracy, which sparked some debate when I discussed some of the principles on the blog (original post here and do read some of the comments, very interesting perspectives). I am sure this article in print will get create some debate again, and I hope that6 debate may lead to some innovations to move the business forward. When I was in LA at the PGA conference, there was much talk about mobile media and cross platform media, all pointing to an architecture where all content is available globally and on all devices. I am sure this will come to pass. You can read the Moviescope Article here and it will be in print in the coming weeks. OK as promised, here is a roundup of Day 2 of the Produced by Conference. There were three sessions going on at any one time, so I could not get to everything. The morning kicked off at 9am with a look at mobile technology as a new media platform. The basic gist is that now with personal devices like the iPhone, it is possible to deliver high quality video and other content to 2 billion people across the globe. Two things became clear. First, mobile technology is even more pervasive than the internet. Second, the internet has a culture of free content, where mobile technology has a culture of ‘paid for’ content and services. This is very interesting for indie film makers. Innovations such as mobile video headsets, new operating systems that are easy to navigate and built in projectors are changing the face of these devices. It’s certainly going to evolve as a new platform for us all to consider very seriously. I think the key is that the monetisation is built into the mobile model. All interesting stuff. Following this was a comparison of all the major HD cameras, which was incredible and I will report on it next time on the blog (as it will be a bit lengthy). Yes they did test RED ONE and it was quite revealing. It was also my first time in the big Carry Grant Theatre were the awards were held. Sweet. The next session was about 3D cinema. I had already seen a 3D test on a 3D TV and was blown away, so I was looking forward to this chat. What struck me while listening was that the panel was made of about six guys, aged between 35 and 65, all looking very respectable, all babbling enthusiastically about 3d animated guinea pigs in a new 3d movie called ‘G Force’. What’s more, the audience was completely with them too. I know I mentioned this on the blog a day or so ago, but there really is a sense that the ability to Entertain (with a big E) is both admired and seriously rewarded. Most jaw dropping was the demo of Star Wars: Revenge Of The Sith, which had been ‘dimensionalised’, a process where 2D films are made 3D. They took us through how they did it, and showed how they could move and stretch 3D for effect. They could also move and stretch 3D effect for eye comfort too. There is a real attempt to keep the viewers in a similar 3 dimensional space from shot to shot, so as to avoid eye strain inbetween cuts. Of course in real life we don’t have edits in what we see, and our eyes don’t snap back and forth searching for the information to lock onto to create 3d in our brains. This is one major improvement the guys have been working on. The day ended with a 2 hour chat with the guys from Marvel Studios, which was great fun. Of course, my mind kept swinging back to the fact that in 2 hours time, the PGA awards would be taking place, so it was hard to concentrate. The conference was really terrific and if you are in LA next year, I recommend you try and get yourself to it. Next time on the blog… as promised, the digital camera roundup. And yes, WE WON! I didn’t know at the time but producer Gale Anne Hurd (Terminator, Aliens, Incredible Hulk) was sat at the back and came out to present the awards. When our name was read out I nearly passed out as I was now about to share a stage with the producer of one of the most influential films of my life, ‘Aliens’. I am afraid I babbled on stage, and managed to put my foot in my mouth several times, but hey! The award actually goes to both Ivan and myself and includes some free time at a sound mixing studio, a copy of Final Cut Pro, but best of all, a mentoring lunch (and hopefully a longer term relationship) with a major Hollywood producer. AWESOME! At the after awards party, Gale came up to me and told me how much she enjoyed the film. I can’t remember exactly what she said but it was extremely complimentary. Rachel Klein, one of the big cheeses at the PGA, also told me that the judge’s decision was unanimous. Awesome. Right. Now I have to capitalise on this win. I am working with Andy my manager to set meetings up this week, and penning a press release right now. Chaos here. I am about to go into hospital for my first procedure on my tooth today – after which so much of the immediate future will become very clear. 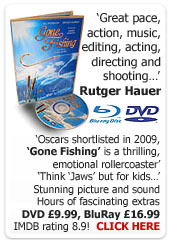 I am booked in for another procedure next week too, but in-between, I may be shooting off to LA to the Producers Guild Of America Awards on Sunday night, where Gone Fishing is nominated for best short film (part of a PGA weekend of industry seminars). Add to that I am supposed to fly to Tokyo on Monday for the Short Shorts Film Festival (something I won’t be able to do if I need to go back to hospital next week)… Everything is SOOO up in the air and frankly, it’s doing my head in! My great fear of course is that I am falling into the trap of doing too much on the festival circuit and not taking care of business, i.e., getting onto the next film. Are these wonderful events just glorious distractions? In a very good way of course. It’s a tough choice. It’s also an exhausting, time consuming and financially expensive choice too. Right, I now have to go and have my head drilled and pummelled for two straight hours!